Members of Emirates Skywards, the award-winning loyalty programme of Emirates and flydubai, can now achieve their next Emirates Skywards tier faster thanks to an exciting new offer to earn up to double Tier Miles on flights. The offer is valid for eligible tickets booked between 26 November and 03 December 2018 (both days inclusive) for travel on Emirates or flydubai flights between 26 November 2018 and 31 March 2019. To be eligible for the promotion, customers must be existing or new members of Emirates Skywards and register for the offer via the Emirates App or by logging into their account online at emirates.com or flydubai.com. Customers must also choose ‘Flex’ or ‘Flex Plus’ fares when flying on Emirates and ‘Free to Change’ or ‘Business Basic’ fares when travelling on flydubai to be eligible to earn bonus Tier Miles. 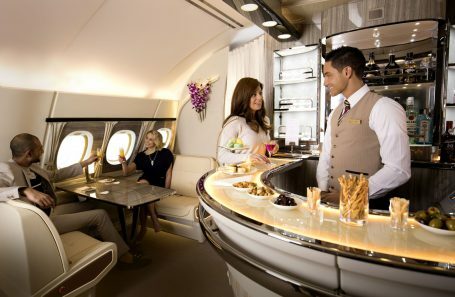 Emirates Skywards offers four tiers of membership – Blue, Silver, Gold and Platinum – each with unique incremental benefits for members including dedicated check-in, priority boarding, lounge access, complimentary advanced seat selection and special Wi-Fi privileges. Members build up their tier status by earning Tier Miles on flights flown with Emirates or flydubai. “We always strive to provide greater value to our customers and offer them access to a much wider range of benefits and rewards,” said Dr Nejib Ben Khedher, Senior Vice President, Emirates Skywards. “Through our latest offer, a first of this scale and reach, Emirates Skywards members will be able to accrue bonus Tier Miles from flights and this means that they can reach their next Emirates Skywards tier faster,” he added. Based on the fare type chosen and the class of travel, Emirates Skywards members may be able to able to move up one or even two Emirates Skywards tiers over the course of a return journey. As an illustration, a new Emirates Skywards Blue tier member completing a return flight between London and Sydney, or New York and Johannesburg, on an Economy Class Flex or Flex Plus fare will be able to earn sufficient Tier Miles to upgrade to Silver tier through this offer. On a Business Class Flex or Flex Plus fare, the same member will earn enough Tier Miles to immediately achieve Skywards Gold tier. In addition, all members will continue to earn Skywards Miles on flights which can then be redeemed on Emirates or flydubai or used to access a wide range of rewards with Emirates Skywards partner airlines, hotels, retail and lifestyle outlets across the world. Customers can also pool up to 100% of their Skywards Miles under the ‘My Family’ programme to redeem rewards faster than before. Currently, Emirates Skywards has over 23 million global members. The programme continues to deliver value, choice and flexibility to its members through its strategic global and local partnerships including co-branded cards and through more personalised and targeted offers including access to unique money-can’t-buy-experiences at events worldwide.